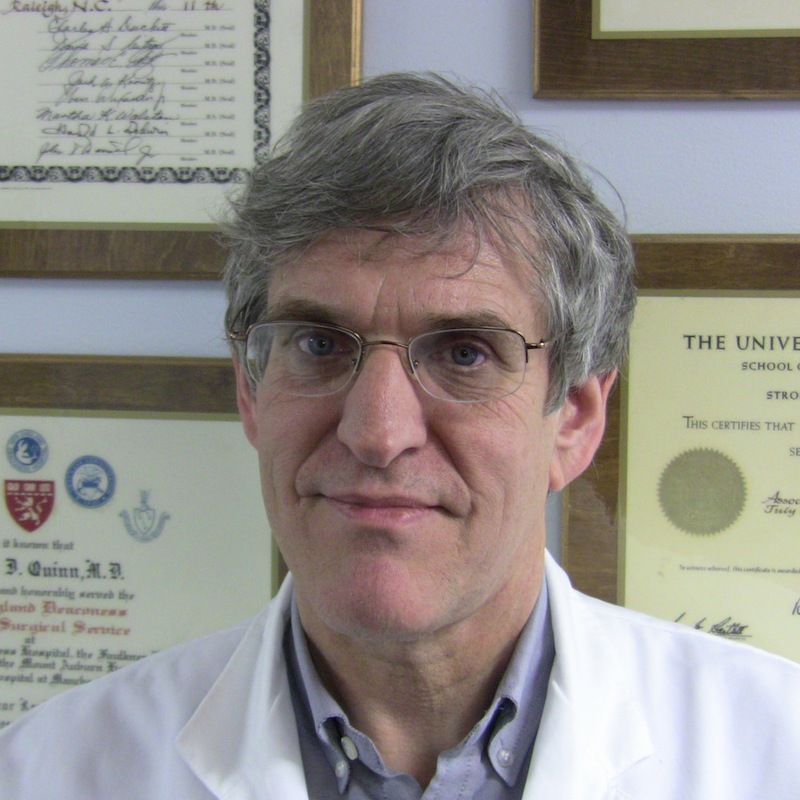 Dr. Robert P. Quinn is an ear, nose, and throat specialist certified by the American Board of Otolaryngology (ABO) in Otolaryngology and, as of February 2018, is also certified by the ABO in Sleep Medicine. He has practiced in the Piedmont area of NC for more than thirty years. He is a member of the American Academy of Otolaryngology—Head and Neck Surgery, the American Academy of Otolaryngic Allergy, and the American Academy of Facial Plastic and Reconstructive Surgery, and provides emergency and scheduled surgeries as a staff physician at Atrium Health, formerly Carolinas Medical Center—Northeast, NovantHealth-Rowan Regional Medical Center, and the Gateway Surgery Center. Dr. Quinn grew up one of seven children in Cleveland, Ohio, where his parents were schoolteachers. He studied biomedical engineering at Northwestern University in Chicago and won the Steven Kovacs Scholarship to attend medical school at Ohio State University, where he graduated in 1980. In 1981, he returned to Cleveland for a surgical internship at the University Hospitals of Cleveland; the following year, he moved to Boston for a surgical residency with the Fifth Harvard Surgical Service at New England Deaconess Hospital (now Beth Israel Deaconess Hospital). He then completed a three-year residency in head and neck surgery at the University of Rochester’s Strong Memorial Hospital. All three institutions are ranked among the top 3% of hospitals in the United States by U.S. News and World Report. In 1986, after spending a year as a fellow in Otolaryngology at the Lenox Hill Hospital in New York City, he moved to Concord. Two years later, he opened a solo practice in order to allow himself to devote time to developing a personal relationship with patients. Quinn Ear, Nose, and Throat has been serving patients from around the Piedmont with a personal touch ever since. Recognizing the importance of adequate sleep and improvements in sleep technology, he chose to continue his education and in November, 2017 took and passed a comprehensive test with the American Board of Otolarygology Subspecialty in Sleep Medicine.